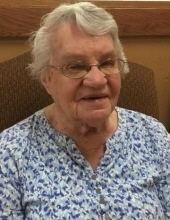 The memorial service for Viola G. Mohr, 95, of Aberdeen, SD, and formerly of Roscoe, SD, will be 11:00am, Saturday, April 13, 2019, at Spitzer-Miller Funeral Home, 1111 S. Main St., with Pastor Justin Dauck officiating. Inurnment will be at a later date at Morningside Cemetery, Roscoe. Viola joined the angel chorus on Tuesday, April 9, at Avera Mother Joseph Manor, Aberdeen. Viola G. Walth was born June 22, 1923, to John and Magdalena (Walth) Walth in McPherson County, SD. As a young girl, Viola tended cattle on horseback and played the harmonica to soothe them. After receiving her education, she worked as a nurse’s aide at the hospital in Eureka. On October 21, 1945, Viola was united in marriage to Otto Mohr in rural Hosmer, SD. They farmed together until 1963 when they moved into Roscoe and started Mohr’s Café. In 1969, they got out of the restaurant business and Viola provided child care as needed over the years. She also worked at Donnie’s Café for a short time. Otto passed away in 1995, and Viola stayed in Roscoe. She later lived in assisted living in Roscoe, Hosmer, and later Aberdeen, before moving into Avera Mother Joseph Manor. Viola was a member of St. Paul’s Lutheran Church, Roscoe. She was also a member of Roscoe Commercial Club and Roscoe Senior Citizen’s Center. Viola enjoyed crocheting, making rugs on a loom, and making crafts. She also loved to bake. Viola had a passion for music. Whether it was playing the harmonica or playing the piano and singing, she always found joy in music. Grateful for having shared Viola’s life are her sons: Merle (Janice) Mohr, Mina, SD, and Harley (Darlene) Mohr, Aberdeen, SD; her grandchildren: Tatum (Benjamin) Klingbeil, Dana (Lisa) Mohr and Ryan (Jill) Mohr; her great-grandchildren: Iris Klingbeil, Calla Klingbeil, Taylor Mohr and Skylar Mohr; sister-in-law: Mary (Jimmie) Williams; and Viola’s special friend: Beth Fischer. Preceding Viola in death are her parents, husband, and three siblings: Oscar Walth, Gertrude Mohr and Alma Koerner. To send flowers or a remembrance gift to the family of Viola G. Mohr, please visit our Tribute Store. "Email Address" would like to share the life celebration of Viola G. Mohr. Click on the "link" to go to share a favorite memory or leave a condolence message for the family.